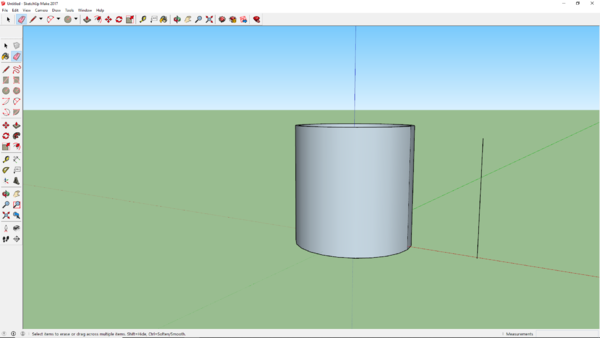 SketchUp 2017 is a free CAD software that anyone can learn to use! 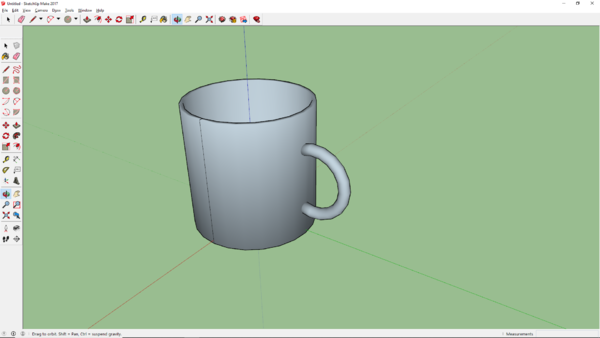 This wikiHow will teach you how to create a simple coffee mug in SketchUP 2017. Go to the top of the page and click the View tab. Then click Toolbars. A popup will appear. click Large Tool Set; then hit Close. The "Orbit" tool is used to rotate the view around the point the mouse clicks. The tool looks like 2 red and green arrows circling around a black line. 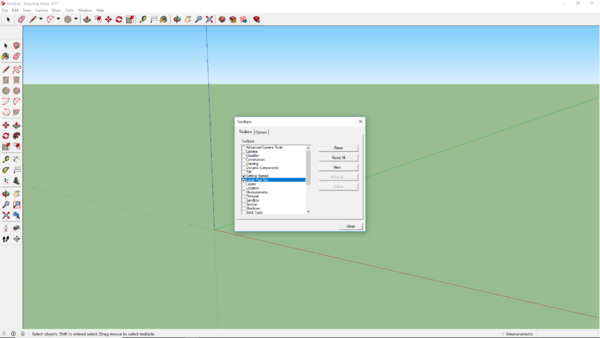 The "Pan" tool allows you to click and drag the view. The tool looks like a hand. 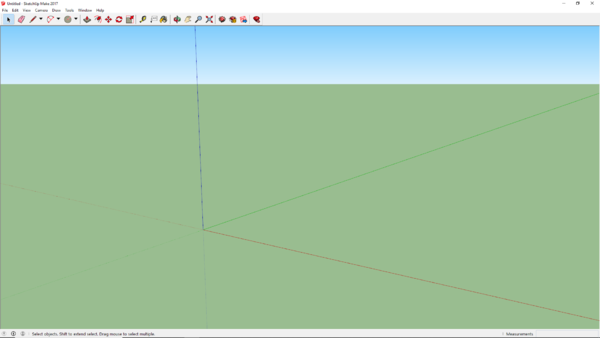 First use the "Line" tool and click on the origin (where the red, blue and green lines meet). The "Line" tool is on the left and looks like a red pencil. 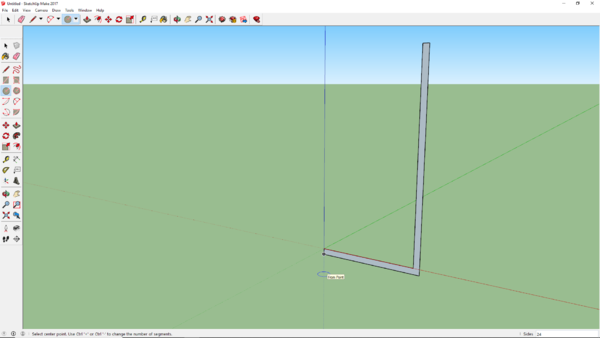 Move your mouse up to put your new line on the blue line otherwise known as the Y-axis (your line will also turn blue). Type in 4" and hit ↵ Enter. The line will size itself. Move your mouse to the right so it is parallel with the red line known as the X-axis (your line will also turn red). Type in 2" and hit ↵ Enter. The line will size itself. Move your mouse down until it turns blue. Type in 4" and hit ↵ Enter . The line will size itself. 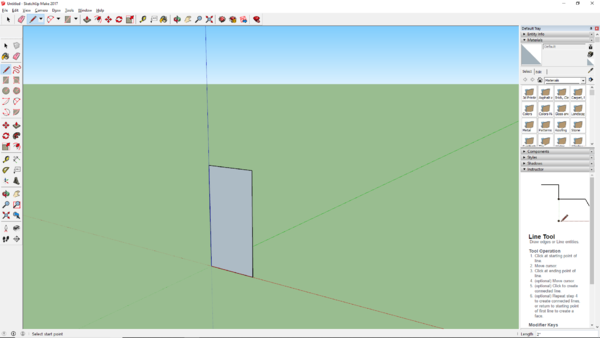 Move your mouse to the left and you can now click on the origin to complete a rectangle. 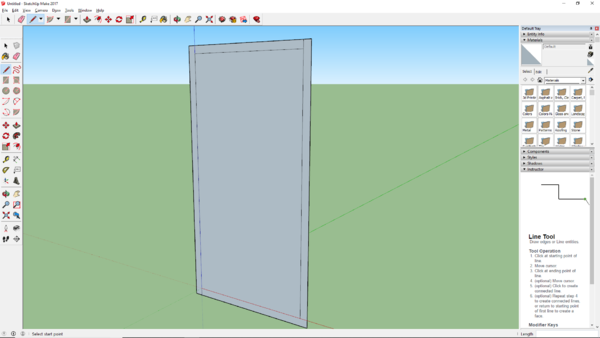 The rectangle will fill itself in and become a solid object. Use the "Offset" tool. The tool is on the left side and looks like a red arrow pointing to a red curved line. Click on your existing rectangle. Type in 1/8" and hit ↵ Enter. 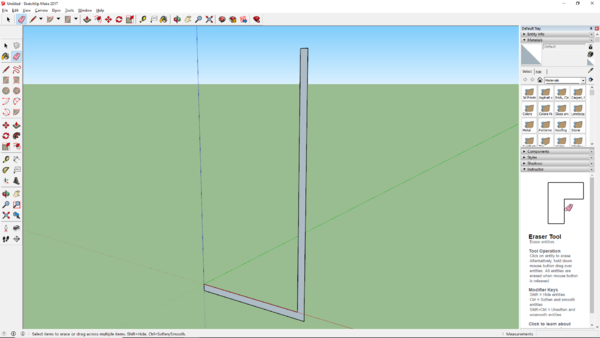 Create a line using the "Line" tool from the top right of the original rectangle to the top of the new rectangle. Create a line using the "Line" tool from the bottom left of the original rectangle to the bottom of the new rectangle. Use the "Erase" tool to remove the lines left of the lines you just made until it looks like the image. The tool looks like a pink eraser. Click the "Circle" tool and hover over the origin point. It is on the left side and looks like a circle with a red radius. Moving your cursor down from the origin will create a guideline to help keep your circle centered on the shape. Click on the bottom right corner of your shape to complete the circle. Select the "Follow Me" tool and click on your shape (not the circle); use the cursor to go around the outside of the shape 360 degrees until it meets the starting edge. The "Follow Me" tool is found at the top of the screen in a tab labeled Tools. You will need to use the "Orbit" tool to change the view so that you are looking down on the shape. 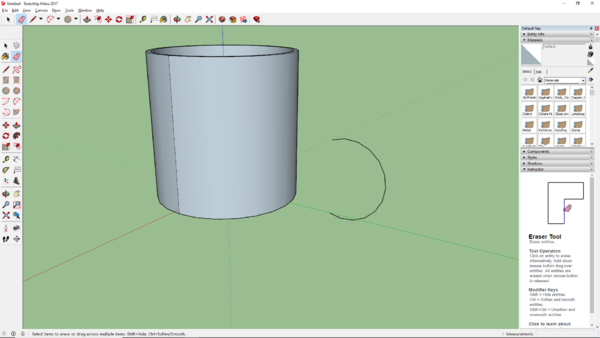 You can now use the "Erase" tool and remove the circle under the mug. 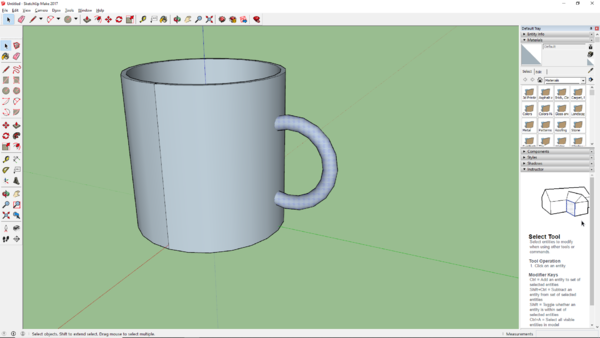 Use the "Line" tool to create a vertical line next to the coffee mug. Use the "2 Point Arc" tool by clicking on two points on the line spaced 2" apart and pulling it out along the red line (X-axis) then type in 1 1/4" for the arc radius. The tool is on the left side and looks like a black arc with a red perpendicular T in it. Use the "Erase" tool to remove the vertical line you last made without erasing the arc. 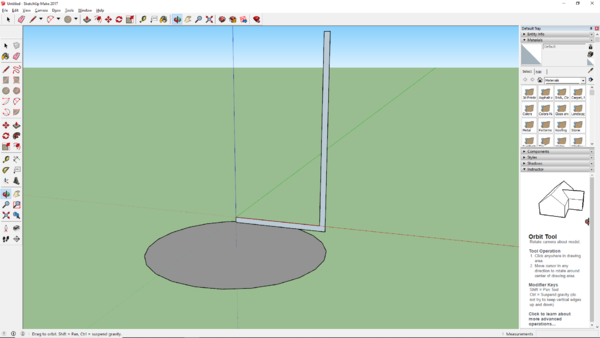 Use the "Circle" tool to create a 3/16" circle at the top end of the arc. 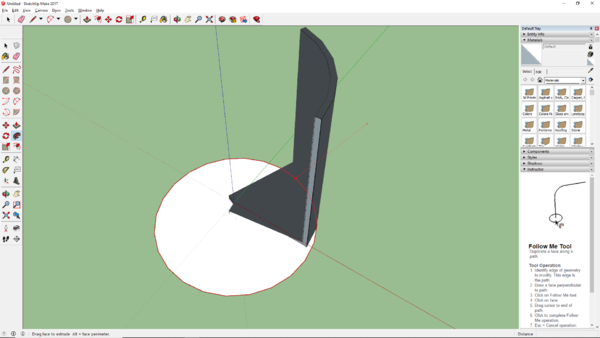 You will need to rotate the view using the orbit tool so that you are facing the top of the arc. 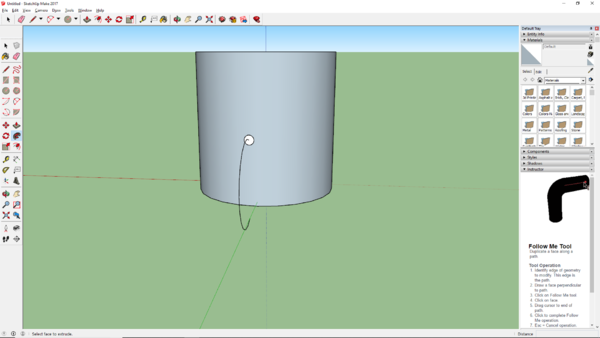 You will now select the "Follow Me" tool and select the circle you just made and pull it down the arc to make the arc 3D. Use the "Select" tool then click and drag a box around only the handle. The tool looks like a mouse cursor. 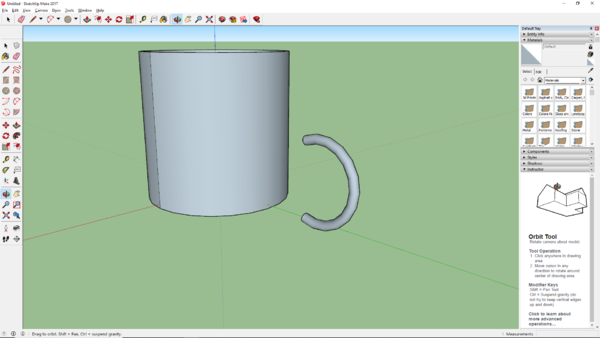 Use the "Move" tool and drag the handle to the mug. The "Move" tool looks like 4 red arrows combined to form a +. You may need to play around with different angles using the "Orbit" and "Pan" tools to get it to line up right). Use the "Select" tool then click and drag to highlight the entire object. Right-click to select "Make Group". This is very important if you want to 3D print the object. Right-click the mug again and select "Soften Edges" and move the slider to the right to soften the edges. The slider will appear at the bottom right. 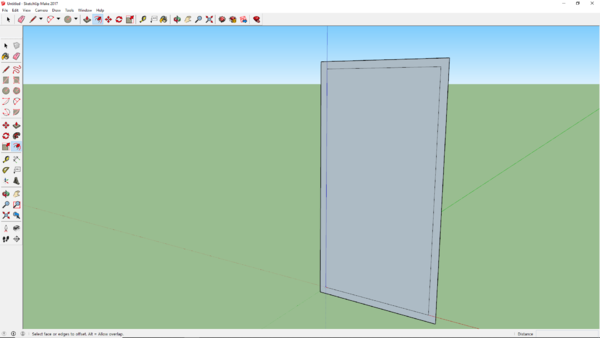 Click the File tab at the top and then click Save to preserve the 3D model for future editing or to have it printed. 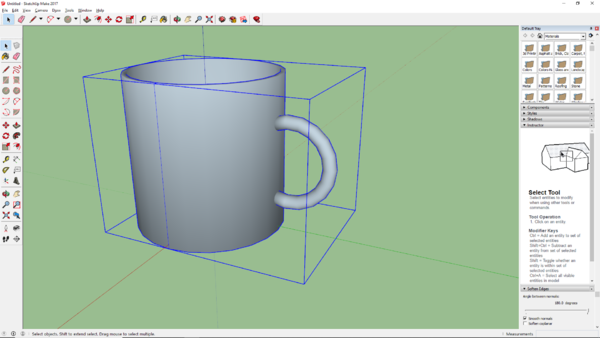 Enjoy your new 3D mug!